On the evening of September 25, H.E. 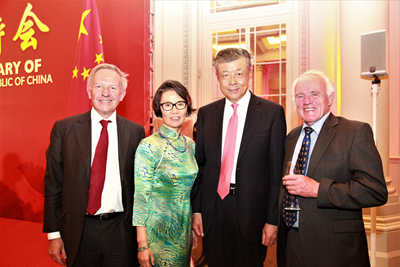 Ambassador Liu Xiaoming and his wife Madam Hu Pinghua held a grand reception celebrating the 68th anniversary of the founding of the People's Republic of China at Langham London. Chinese and British friends old and new from all walks of life were gathered at the brightly-lit hall permeated with beautiful melodies. Nearly 400 people attended the reception, including Stephen Barclay, UK Economic Secretary to HM Treasury, Lord Clement-Jones and Jeremy Lefroy, Deputy Chairs of the All Party Parliamentary Group on China (APPGC), Lord Sassoon, Chairman of China-Britain Business Council (CBBC), Sir Martin Davidson, Chairman of the Great Britain-China Centre (GBCC), Stephen Perry, Chairman of the 48 Group Club, Sir Sherard Louis Cowper-Coles, former Foreign Secretary's Special Representative, Sir Anthony Charles Galsworthy, former British Ambassador to China, Lord Wilson of Tillyorn, former Governor of Hong Kong, and guests from British Government, Parliament, business, scientific, educational and cultural sectors, as well as the diplomatic corps in London, overseas Chinese and students, and representatives of Chinese institutions in the UK. 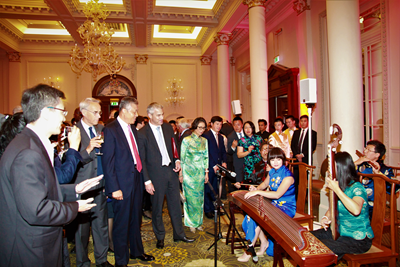 Before the reception started, musicians from the UK Chinese Music Ensemble presented quartets of traditional string and wind music: A Moonlit Night on the Spring River and Dance Music of the Yao Nationality. The beautiful Chinese music was perfectly matched with the early autumn moonlight of London. Guests at the reception enjoyed and responded with warm applause time and again. Ambassador Liu delivered a warm speech at the reception. Ambassador Liu first recalled the 68 years of China's development since its founding, noting that it has been a journey from being weak and poor to gaining independence and becoming prosperous. It has seen China's historic leap forward, in which the nation has got up on its feet, set out to achieve prosperity and grown from strength to strength. The most rapid and spectacular progress was achieved in the past four decades since China began its reform and opening-up. China has become the second largest economy, with significantly bigger role and influence in the world. More recently, the Eighteenth National Congress of the Communist Party of China five years ago set out the "Two Centenary Goals" and mapped out the blueprint for achieving the "Chinese Dream" of national renewal. The past five years have witnessed how the Chinese nation made vigorous efforts and move ever closer to these grand goals. Ambassador Liu summarized the past five years with five "big's", five "new's" and five "achievements": first, big shift in growth model, new growth engine for the world and achievement in building a "prosperous China"; second, big improvement in livelihood, new journey towards a moderately prosperous society and achievement in building a "happy China"; third, big strategy to advance rule of law, new chapter in strengthening Party discipline and achievement in building a "rule-based China"; fourth, big agenda in opening-up, new possibilities of the Belt and Road and achievement in building an "open China"; fifth, big blueprint of peaceful development, new diplomatic concepts and achievement in building a "peaceful China". Ambassador Liu then reviewed the extraordinary 45 years since China and Britain established Ambassadorial diplomatic ties. He pointed out that the current international and regional situations are undergoing profound and complex changes. Brexit is bringing uncertainties and instabilities. However, the shared commitment to China-UK "Golden Era", the win-win nature of China-UK bilateral cooperation, and the strategic and global significance of China-UK collaboration on international issues remain unchanged. The steadily growing China-UK relationship has huge and untapped potential. Looking into the future, Ambassador Liu listed out five opportunities that China and the UK needed to grasp. The first opportunity is China-UK "Golden Era". The second one comes from China's development. The third will arise from dovetailing development strategies of our two countries. The fourth lies in the extensive, friendly exchanges between China and Britain. Last but not least is the opportunity for cooperation between China and Britain on international issues. 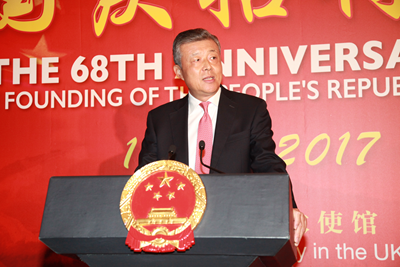 Ambassador Liu said that on the occasion of celebrating China's 68th National Day, another major event is drawing near. That is the 19th National Congress of the Communist Party of China to be held in Beijing on 18 October. It will be a highly important meeting when China is right now in the run-up to the realization of a moderately prosperous society and in a crucial time for the development of socialism with Chinese features. The meeting will review China's overall progress in the past five years and draw lessons and experience. On this basis, it will make action plans and design fundamental policies that are forward-looking and in keeping with the times to help make sure the giant ship of China will continue to ride the waves and go full steam ahead. In closing Ambassador Liu quoted a Chinese old saying, "A partnership forged with the right approach defies geographical distance; It is thicker than glue and stronger than metal and stone." 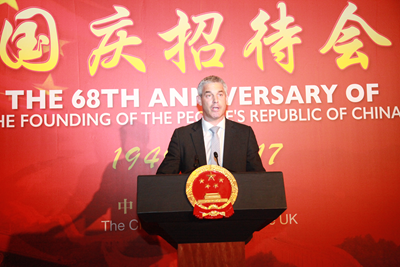 He emphasized that as long as China and the UK take the bilateral relations from a strategic and long-term perspective and seize the five opportunities, the two countries can build an enduring China-UK "Golden Era" with more remarkable achievements, with a more promising future and with more "golden fruits" for their people and the people of the world. 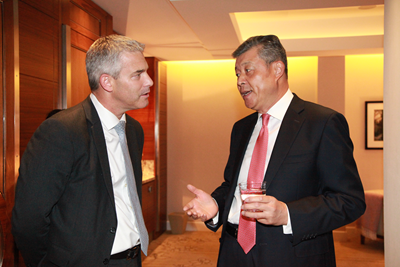 Stephen Barclay, UK Economic Secretary to HM Treasury delivered a speech on behalf of the British Government. He first extended congratulations on the National Day to the Chinese Government, Chinese people and overseas Chinese in Britain. Hailing the good momentum of China-UK relationship, Barclay said that Britain has closer high-level exchanges and more frequent dialogues at various levels with China than other EU countries. Last May, Philip Hammond, Chancellor of the Exchequer attended the Belt and Road Forum for International Cooperation as a special envoy of Prime Minister Theresa May. This shows that Britain is a natural partner for China's Belt and Road Initiative. Britain is looking forward to a new round of Meeting of the UK-China High-level People to People Dialogue and China-UK Economic and Financial Dialogue this year. The two countries have made good progress in trade and investment, RMB internationalization, green finance and other areas. Chinese students are the largest foreign student groups in the UK; the number of visas issued to Chinese citizens has reached a record high, and Chinese visitors have made great contributions to the British economy. At present, Britain is engaged in Brexit negotiations, while it is also committed to creating a "global Britain", safeguarding the open global trade system and actively seeking free trade agreements with other countries. All of these have brought new opportunities to China-UK cooperation on economy and trade. As permanent member states of the UN Security Council, China and the UK have conducted good cooperation on climate change, anti-terrorism and combating modern slavery. Britain is convinced that China-UK relationship will reach a new high in the future. The reception went on in a warm and cheerful atmosphere. Guests spoke highly of China's achievements and expressed their confidence in China and the future of China-UK relationship. The Embassy also held a photo exhibition themed "Chinese Stories" and displayed books and picture albums on China's development and domestic & foreign policies. Guests slowed their steps to view the photos and collect the books. Representatives from Chinese and foreign media including People's Daily, Xinhua News Agency, Phoenix TV, and BBC attended and reported on the reception.